Sergeant Adam Gray made it home from Iraq only to die in his barracks. For more than three years, reporter Joshua E. S. Phillips—with the support of Adam’s mother and several of his Army buddies—investigated Adam’s death. What Phillips uncovered was a story of American veterans psychologically scarred by the abuse they had meted out to Iraqi prisoners. How did US forces turn to torture? 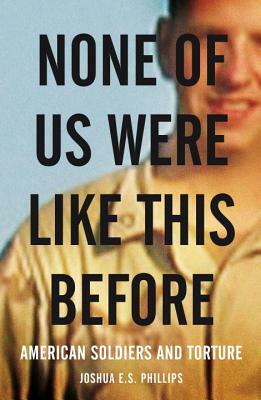 Phillips’s narrative recounts the journey of a tank battalion—trained for conventional combat—as its focus switches to guerrilla war and prisoner detention. It tells of how a group of ordinary soldiers, ill trained for the responsibilities foisted upon them, descended into the degradation of abuse. The location is far from CIA prisons and Guantanamo, but the story captures the widespread use and nature of torture in the US armed forces. Based on firsthand reporting from the Middle East, as well as interviews with soldiers, their families and friends, military officials, and the victims of torture, None of Us Were Like This Before reveals how soldiers, senior officials, and the US public came to believe that torture was both effective and necessary. The book illustrates that the damaging legacy of torture is not only borne by the detainees, but also by American soldiers and the country to which they’ve returned. Joshua E. S. Phillips is based in New York City and has reported from Asia and the Middle East. His work has appeared in the Washington Post, Newsweek, Salon, the San Francisco Chronicle, and the Atlanta Journal–Constitution, among other publications. His radio features have been broadcast on NPR and the BBC. In 2009, Phillips received the Alfred I. duPont-Columbia University Award and the Newspaper Guild’s Heywood Broun Award of Substantial Distinction for his American Radio Works documentary What Killed Sergeant Gray.